Shortly after the last runway presentation in New York, IMG will be packing it up and hitting the road. Starting in March, patrons of Dallas, Houston, Chicago and San Francisco will be able to view the fall 2007 collections (from select designers) through Fashion Week Live , for a price of $500, $1,200 or $1,500 (depending on the package they buy). I thought this was a fantastic idea - bringing fashion/high fashion/fresh fashion to the general public. I thought it was a great p.r. move, that was until I clicked on the "tickets" tab. What a $500 ticket buys you - great seats, champagne, a gift bag and access to the after party. A $1,200 ticket will get you what a $500 ticket would but with premium seats, red carpet entry, a platinum gift bag and preferred parking. A $1,500 ticket will get you what a $1,200 ticket would but with front row seats, post show access and valet parking. To be completely honest I am not to impressed with these benefits. I don't agree that this event should be a priced event, and if it needs to be a priced event, shouldn't it be within a reasonable amount, say max $100? Obviously this event is for the high society women within these cities, who have the extra money and want to start planning their purchases earlier. So much for bringing this fashion to the general public. I am curious to see how these nights turn out. The Sartorialist recently posted this image of Vogue Italia Editor in Chief Carla Sozzani. For some reason, I recognized her. How is this possible? Even if it would not have indicated that it was her, I would have recognized her or at least assumed it was her. Is it her legs? her hair? Maybe it's the shape of her coat, I have seen her in a coat like this before. 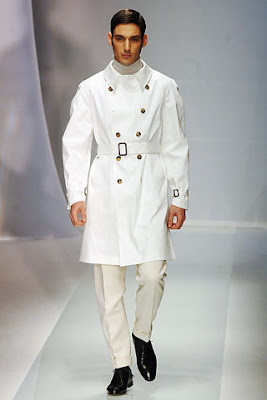 A great coat I might add. 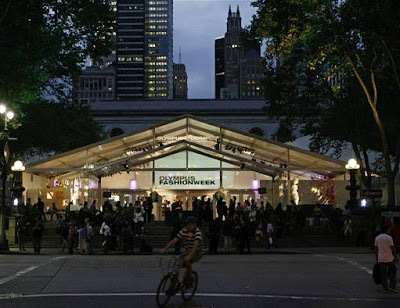 NY fashion week starts in 4 days and I am happy to announce that Miss Stylologist has been accredited by IMG and will be in attendance this season. I hope to bring you a timely review of everything that is happening under the tents, both, on and off the runway. I am still busy receiving and requesting invitations, so I am not sure what shows I will be attending but I plan to see as many as I can. I look forward to reporting direct from Bryant Park and I hope to deliver some great pics, reviews, scoops, sightings, hearings and news. The theme: "the metamorphosis of sailors into mermaids.” The background: a heavy, foggy mist and water heavily dripping onto a gray slab. The inspiration: Taranto, a seaport in Puglia, Italy. The person: Riccardo Tisci for Givenchy spring 2007. The metamorphosis of sailors into mermaids - I guess this revealed itself in the oversized captain hats and jackets? 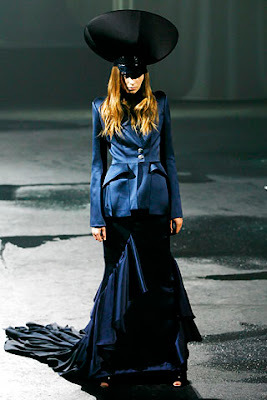 However, before reading the show review on style.com, I thought a little Goth and a little un-directional. 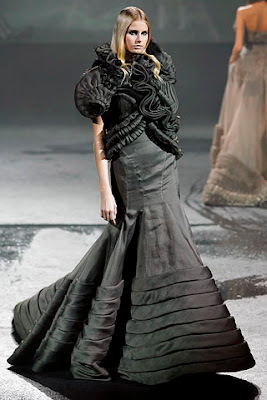 While I loved the exaggerated blown out of proportion hats , as well as the beautiful and intricately cut, draped and molded gowns, I saw little in terms of a great, inspirational, leading collection. I do think that Riccardo Tisci is great but I do agree with Sarah Mower in that he needs more time to develop into a grand couturier. 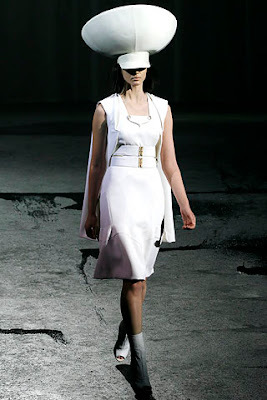 And I also think that fellow blogger fashionologie was right on when she said that the Givenchy caps are the new Balenciaga helmets. Elie Saab's spring 2007 couture show made for an Oscar dress dress rehearsal. One dazzling dress after another, his show was chock-full of choices for Hollywood’s starlets. It seems that spots are roaring in for spring, grey ones though, not your traditional brown, black & beige. 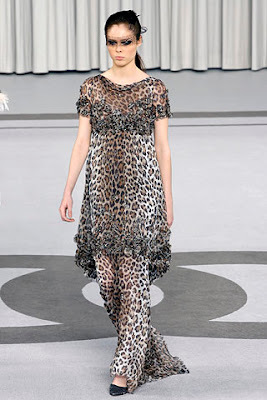 Seen on the Chanel Couture Spring 2007 runway(definitely a new turn for Mr. Lagerfeld) and in multiples in the February Vogue (courtesy of DKNY). A different side of Armani indeed. 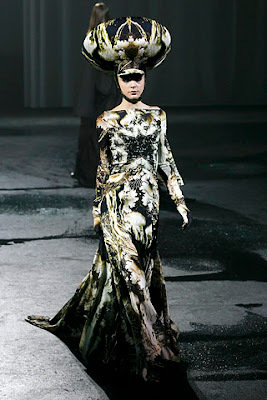 The Armani Privé spring 2007 collection brings out a new side to Armani, or rather the Armani woman. 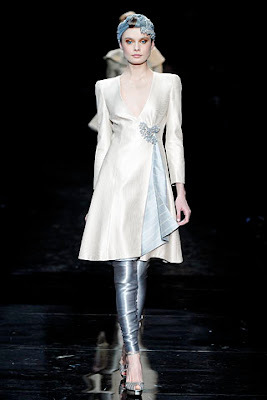 This collection was a merge between the classic Armani, we all know, a rock 'n' roll-ish edginess, that is completely new, and might I add unexpected (I think it was the leggings that evoked this feeling in me), a glamorous air (especially those red carpet worthy gowns) mixed with an ethnic undertone. And might I add, I felt a little bit of a Chanel thing going on, (both old and new Chanel). 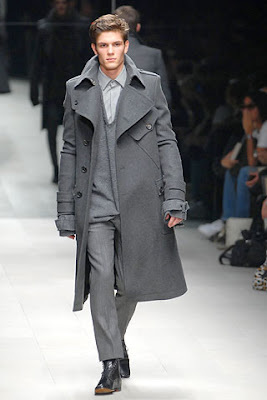 I enjoyed seeing this new side to Armani but am a little upset for missing the live broadcast on msn.com. Did anyone get a chance to view it? 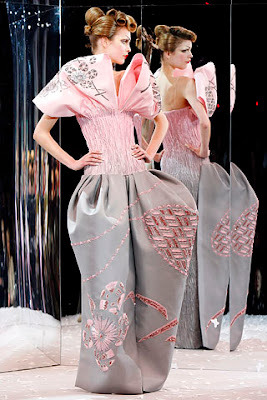 Two other of my absolute favorite John Galliano couture masterpieces from the spring 2007 Christian Dior. The entire collection was phenomenal as my previous post indicates but when I fell upon this final image, I could swear my heart skipped a little beat. I fell in love with this magnificent origami pleated creation. Yes, origami pleated. When have you ever witnessed fabric pleated into origami-like folds? 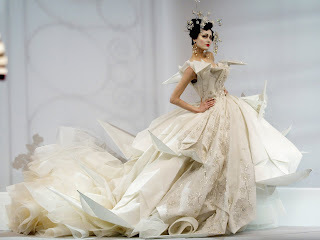 I have never witnessed such ethereal beauty and intelligent imagination of this magnitude on the runway than with this John Galliano for Christian Dior finale dress. Welcome 2007. Welcome a new era of fashion history. His collection, from what I viewed on style.com, was simply brilliant. His couture collections usually are, yet there are always those lackluster seasons but I could assure you this was not one of them. Yes, these clothes may not be wearable as viewed on the runway but that is what couture is all about - bringing the imagination to life without regard for any rules or restrictions. It is always such an amazing feat to be able to, twice a year, enter the realm of Mr. Galliano’s über creative consciousness. His imagination is incomparable. He is untouchable and unstoppable and I am pleased to be in this era to witness such marvel. Now, if I can only score an invite to a show. The Spring/Summer 2007 Armani Privé couture show will make internet and fashion history when it will be broadcast live from Paris at www.msn.com and on Cingular cellular phones at 3:00 p.m. EST (9:00 p.m. Paris time). The Proenza Schouler line for Target is set to hit stores (online & offline) February 4th but thanks to fellow bloggers for their incredible searching (Nitrolicious, TheFashionSpot & ShopDiary), you can now purchase it online. You will not be able to find it through the target website but you can shop for the collection through shoplocal.com. You better hurry because some of the items are already sold out (not sure how that happened seeing as though this is a secret) but apparently some of the best pieces are gone. Oh and...for an extra 10% off, use promo code:TCLKMJFK (until 01/27), and promo code: TGTSAVE3 (until 01/31). Buy any three items and recieve free shipping until 1/27. And in case you are in the NYC area between February 2nd - 5th, Opening Ceremony will have the entire collection available for sale as a promo for the launch. Paris couture week is among us, I can't wait to see what the shows reveal. Looking over the show schedule, I noticed an increase of couturiers. It seems that the Chambre Syndicale de la Haute Couture has many new guest members. There are definitely some newcomers whom I never heard of before. Does this mean that couture is not disappearing like once feared? Is couture back? Well, it may take a while to decipher the state of the couture industry, but I certainly hope that it makes a strong, and lasting comeback. 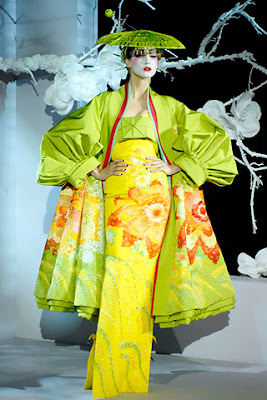 Fashion just would not be as exciting, now would it? Shows I am looking forward to: (the greats of course) Christian Dior, Chanel, Givenchy, Jean Paul Gaultier and Christian Lacroix and I am also interested in viewing some of the newcomer collections. 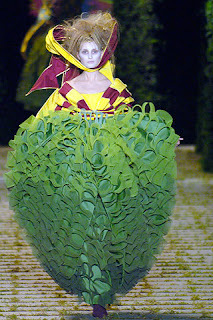 Apparently this is spring's key dress shape. Great news as I love a great A-line silhouette. Bow ties for girls are in. I'm not too sure about this one. Definitely a trend to watch. I’m all for keeping our earth clean and slowing the effects of Global Warming. It seems that the back is the new front (more on this later). Lucite is all the rage and was seen all over the spring runways. I guess it's time to dust my ol' pair off and manicure my toes. This is spring’s newest sleeve detail. I’m quite excited my this new trend and can’t wait to sport it. A huge trend for spring, yet not too sure how much I love it. Some of the designers did it so well that it is barely wearable. View the complete list at Net-a-Porter. I absolutely want it. 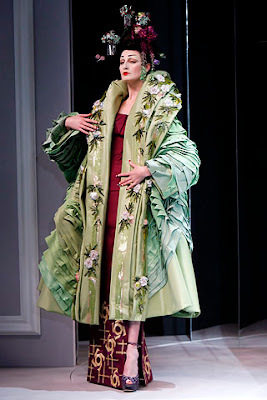 I think it was from the fall 2006 collection but this is a fantastic coat for spring. Yes, as NET-A-PORTER says, it's irresistible. As I was flipping through the Allure issue last month, I tore out this page. 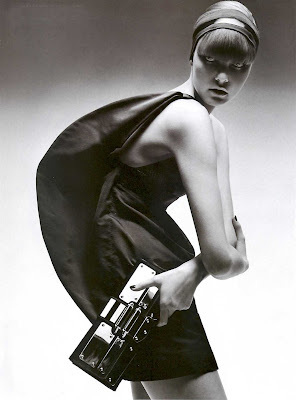 As do many, this image is one that stood out as a great fashion image. I love that it is black and white. Well, I love pretty much everything about it - the Gucci parachute dress, the clutch, the hair, the bangs, the headband…yet most of all, the photography. This is certainly allure-ing fashion photography. Kudos to Michael Thompson. Fellow blogger The Sartorialist is in Milan covering men's fashion week street style for men.style.com, yet he has also been taking some interesting shots of the ladies. I have been viewing his photos since he arrived and thought to share some of my favorites. It's great to see style from different parts of the world and I am grateful to The Sartorialist for doing such a good job at capturing it for us. She makes the all black look work. Love her trench (and her hair color). Harem capris over leggings...very interesting. 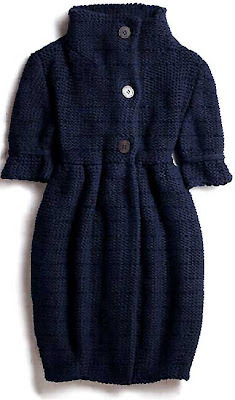 A great caplet and great dress. 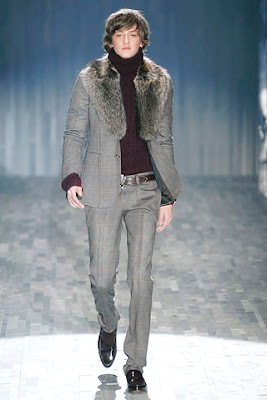 Love the whole look, except the fur (not a fan of fur wearing). While all the hype and focus was directed westward for yesterday's Annual Golden Globe Awards, much hype and focus was concentrated north of Italy, in no other, but Milan for men's fashion week. 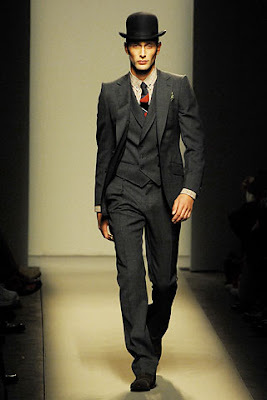 Flipping through the men's shows I realized that I tend to gravitate toward the men-in-suit look and appreciate a classic sartorial look. Hence, my high admiration for the Valentino, Gucci, Bottega Veneta, Burberry Prorsum and Dolce & Gabbana shows.